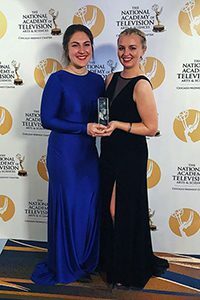 Erin Law, Class of 2012, received a Crystal Pillar Award at the the Chicago-Midwest Chapter of the National Academy of Television Arts & Sciences last weekend! The Crystal Pillar is NATAS’ highest award for student productions. Erin is in her second year of graduate studies, mastering in digital media and storytelling. Erin’s documentary, created with Megan McKinley of California, was “Dress For Success.” The mission of Dress For Success is to empower women to achieve economic independence by providing a network of support, professional attire, and the development tools to help women thrive in work and in life. Congratulations, Erin! We love how you are dreaming big and doing right!